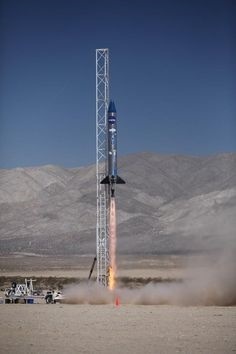 MOJAVE, CA – Student-built rockets will streak into the stratosphere in Spring 2018 as college and university engineering teams from around the world compete for $100,000 in prizes in a contest sponsored jointly by the Mars Society, headquartered in Lakewood, CO and the California-based Friends of Amateur Rocketry (FAR). Announced last year, the FAR-MARS Prize will grant $50,000 to the team whose bi-propellant liquid-fueled rocket comes closest to reaching 45,000 feet (13,716 meters). A second $50,000 prize will go to the team that comes nearest to hitting that same altitude with a rocket powered by liquid methane and liquid oxygen, announced Dr. Robert Zubrin, president of the Mars Society, and Mark Holthaus, director and treasurer of FAR. “If one team can achieve both goals with the same rocket, they’ll win both prizes totaling $100,000,” Holthaus said. The contest launch window will commence Saturday, May 5, 2018, the 57th anniversary of the launch of Alan Shepard, America’s first man in space, and continue through Sunday, May 13th, according to Holthaus and Dr. Zubrin. The goal of being the closest to 45,000 feet, rather than simply reaching the highest altitude, was chosen so teams would have to demonstrate the precise control required to create reusable launch vehicles, Holthaus said. Funds for the prize have been provided by an anonymous donor whose goal is to advance Science, Technology, Engineering, and Mathematics (STEM) education in general and human spaceflight specifically, Holthaus and Dr. Zubrin said. Teams will have about 15 months to design, build and test their rockets before gathering at the FAR rocket launch complex called FAR Site, located north of Edwards Air Force Base, on May 5, 2018. “Each competing rocket must loft a 2.2 pound (one-kilogram) payload, containing an altitude tracking device, to the target altitude,” Holthaus said. “The payload will be supplied by FAR, rockets must be recovered by parachute, and these rockets are required to clear 30,000 feet (9,144 meters) as a minimum to qualify.” The competition will continue over two weekends (May 5-6 and 12-13) if needed, Holthaus noted. Participating teams must be composed of college or university students, with at least one faculty advisor providing guidance, Holthaus said. Teams from the United States and other countries are encouraged to enter and compete; two or more institutions can combine students, faculty and resources for a single entry. For full details on how to enter the contest and the exact rules for the FAR/Mars Society student rocket competition, please click here. The Mars Society is the world's largest and most influential space advocacy organization dedicated to the human exploration and settlement of the planet Mars. Established by Dr. Zubrin and others in 1998, the group works to educate the public, the media and government on the benefits of exploring Mars and creating a permanent human presence on the Red Planet. Friends of Amateur Rocketry, formed in 2003 by amateur rocketry enthusiasts, whose mission is to educate the public STEM fields through the use of amateur rocketry; and to foster rocket technology by supporting individuals, hobbyists, student groups, businesses and other like-minded non-profit entities. Both the Mars Society and Friends of Amateur Rocketry are registered 501(c)(3) non-profit organizations.